I know, who reads posts published late on a Friday afternoon? 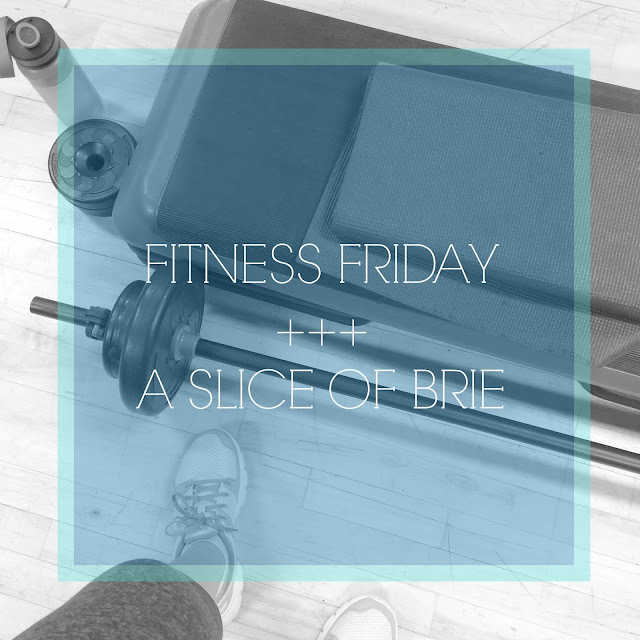 But I couldn't go two weeks in a row without posting a fitness recap since I would be letting myself down! I do most of my blogging the night before a post goes up and last night, Jen invited me to the Bomber Brewing Beer Dinner at National and how could I turn that down!? I've been fighting a brewing cold all week, so my original plan of going to the gym last night probably wasn't going to happen anyway. Anyway, last week, I missed recapping my workouts because basically, after the weekend, they didn't really happen. And then I went into the weekend strong, with workouts on both Saturday and Sunday at the gym. I took Monday off, and then took Sully to the gym with me on Tuesday morning to try him in child-minding for the first time. I only made it through 3/4 of my BodyPump class before one of the caregivers came and got me. He had been crying for almost 20 minutes (my poor heart! ), so I raced out of the class (I missed the lunge, shoulders and abs workouts) and went and grabbed him. It was a busy, busy day in childcare, and there were lots of crying babies, so I'm sure that added to his overall stress of being in there. The ladies working were all so nice and understanding, and we will definitely go back and try again, but next time I will go with the plan to only work out for 20-30 minutes and then build up the time so that he gets used to it. Sully's at that funny stage (well, I'm hoping it's a stage! ), where he's afraid of being around other kids he doesn't know. Later that afternoon, I did hop on the treadmill for 30 minutes at home. I'm slowly building up my running and have decided to follow the 5k training plan that Ashley posted about. I've talked about it briefly before, but once the colder weather hit, I really let running fall by the wayside, despite my best intentions to stick with it. After doing a lot of thinking about how I approach running (both physically and mentally), I decided that I really needed to build up a strong base (again, both physically and mentally), and start from the bottom. I think I get so frustrated with running because I throw myself out there and expect to be able to run for 5k straight and also have a good pace. After reading Ashley's post (where she shares her 5k Training Plan), I knew this was where I needed to start. It's a slow start when following this plan, but I'm confident it will get me to where I want to be in 8 weeks, running wise. After that, the rest of the week fell flat. Wednesday I thought I was coming down with the flu or a very serious cold, so I put myself to bed early. Luckily, that was the worst I felt, and I haven't gotten sick yet, although I still feel a bit "off". Today, I spent several hours walking around the zoo, and I'll probably opt to stay in this evening with my family and hit up the gym tomorrow for CXWorx and Yoga! Then BodyPump on Sunday! Friday: off (unless you count walking around the zoo all morning!). I also initiated a 'Work Week Hustle' challenge on Fitbit for myself and all my blogger friends who also have a Fitbit and the competition has been really fun. While I'm nowhere near winning (I hate losing!! ), it's definitely motivated me to work hard at getting in my 10,000 steps a day! I fell short though on Wednesday and Thursday. So 'A' for effort? Here's hoping next week is a better one! For the parents out there: do you utilize child-minding at your gym? Any tips on getting your toddler comfortable there? Do you follow a running program even when you aren't training for a specific race? On Moon Bitcoin you may get free satoshis. 163 satoshis every 1 hour.